What do you think of the review? (Not crazy right??) Have you read The Demon Trapper novels? What do you think about them? Read Forgiven?? Thanks for the great review. I'm the same way when I read a great book I ramble on about for days to anyone who will listen. I just finished book 1&2 last week and I am dying to get my hands on Forgiven. I hadn't realized that there was already a cover and title for the last book so thanks for sharing! Lol! I'm anxiously awaiting Forgiven! I have it preordered from amazon and will start stalking the mail box in about a week! I can totally understand your obsession with Beck, he is 100% awesome! My favourite character by far (sorry Riley, know it's your series but as I'm sure Kerry-Ann will agree it is Beck therefore you have no hope of competing!) lol but Riley is my second favourite character and I love Peter and Steward as well! I'm so happy we're getting a fourth book but so sad it will be the last book! 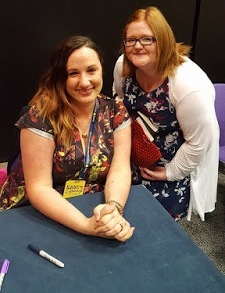 @ Kerry-Ann: Yup, you liked the book, that's for sure (GRINS). Thanks for the great review. There's just something about Beck that hits home with nearly all my readers, including the guys. He's just so brutally human with all his courage and shortcomings. He's been a joy to write. It's rare that an author has a character that becomes that "real". I was really pleased to give Master Stewart and Peter bigger roles in FORGIVEN. That was so much fun because I love them both. I totally agree with your review, but we're going to have to fight over Beck! LOL! Although, having read Jana's excerpt with Peter, he might just be in the running too! I'm looking forward to reading it! Ohh noo as a warning I'll fight dirty! :D lmao. It is truly amazing, you'll love it!